We’ve written abundantly about top software tools for small businesses. From simple contact management, to sales and marketing automation, to analytics and reports, CRM software and its key integrations offer small business owners the opportunity to streamline operations and turn their data into actionable business intelligence. The big names in CRM offer both enterprise and small business solutions, but there’s something reassuring about a company who focuses solely on clients of your type. Small business CRM vendors like Ontraport and Infusionsoft have found success for this very reason: their two-in-one sales and marketing solutions have an exclusive focus on the needs of small businesses, whose employees wear many hats out of necessity, and whose purchases must balance performance and price. In other words, in an ideal world, a platform that allows even a single person to effectively manage nearly all aspects of their business from a single console without breaking the bank. Both Ontraport and Infusionsoft fit this bill. But how do they compare when stacked against each other? Which solution best meets the needs of their target customers? Read on to find out. Ontraport was founded in 2006 when Landon Ray, a serial entrepreneur, decided to switch focus from his real estate marketing company to the development of the Ontraport suite for sales, marketing, and business automation. The platform — which rebranded away from its original name, Office Autopilot, in 2013 — provided CRM functions, content management and lead tracking, rule-based marketing automation, multichannel integration, and online payment processing. Ontraport has won accolades from business publications such as Forbes, which named them one of the Most Promising Companies in America. From 2012 to 2015, Ontraport was also included on the Inc. 500/5000. 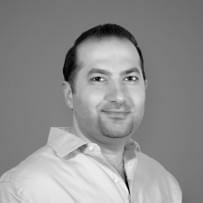 Ontraport is based in Santa Barbara, California and Landon Ray continues to serve as CEO. Infusionsoft was founded in 2001 by Scott Martineau, Eric Martineau, and Clate Mask. After tumultuous early years, Mask wrote the company’s first automation script in 2004, which led to an uptick in sales and an eventual refocus on what would become an encompassing platform for sales and marketing automation, lead generation, CRM and ecommerce solution. Infusionsoft has been recognized for its rapid growth; from 2007 to 2014, Infusionsoft was included in the top 50th percentile of the Inc. 500/5000. Infusionsoft hosts an annual conference in Arizona called ICON for entrepreneurs and small business owners. The company is based in Arizona and Clate Mask remains the CEO. Ontraport and Infusionsoft both offer several subscription tiers — Ontraport offers three and Infusionsoft offers five. (Two of Infusionsoft’s plans are the same price and offer different features.) In this head to head, I will compare Ontraport’s Pro plan with Infusionsoft’s Complete plan. These plans were chosen because they offer a near-complete range of each respective platform’s capabilities at a balanced price point. Let’s take a look at the features of these plans. *Ontraport bills monthly for the first three months, after which customers can opt for an annual contract with an 18% discount. Infusionsoft requires annual contracts that are billed monthly. Note: Neither Ontraport nor Infusionsoft offer free trials. Both allow for online demos; Ontraport requires users schedule a demo with an Ontraport team member, while Infusionsoft allows users to choose from self-guided demos, live webinars or 1:1 personalized demos. See our Pricing section for details into other subscriptions and available onboarding packages. Ontraport and Infusionsoft both offer marketing automation tools, including email marketing, campaign management, lead management, traditional if-then rules and integrations for social marketing (see Integrations for more details). Each vendor brings certain features unique to their platform. 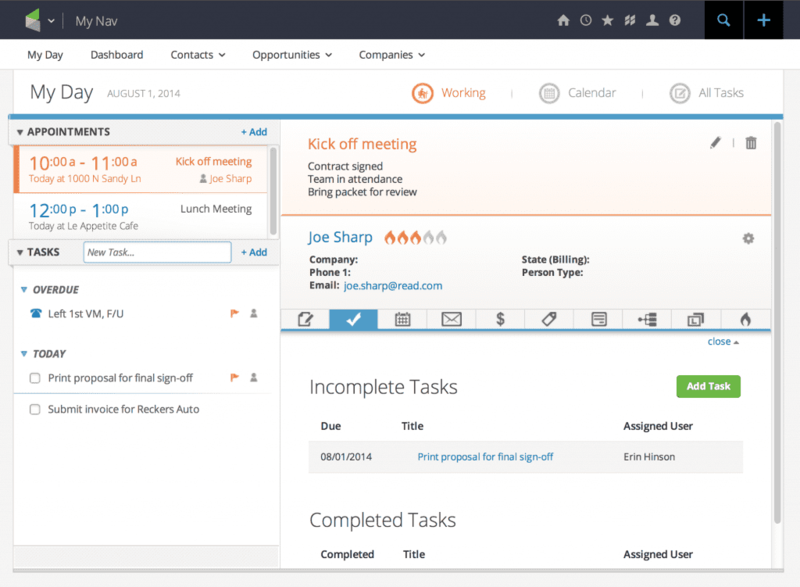 Ontraport allows users to create sequences to automate interactions with contacts. The sequences fall into two general categories: Step Sequences and Date Sequences. Step Sequences operate like drip campaigns and might be used to welcome new members, or provide regular evergreen content and continue through increments of days. Date Sequences rely on calendar dates or date properties, like contact birthdays, membership renewal dates, etc, which are useful for targeted promotions. Ontraport’s email marketing features allow users to design mobile-responsive emails or use templates available in Ontraport’s in-app Marketplace of creative design assets. 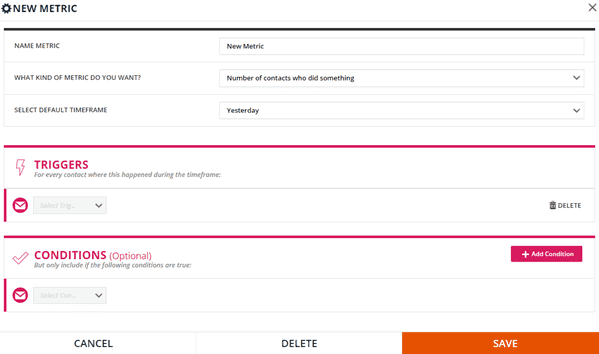 Users can write one-off mass emails, schedule emails or add contacts to specific sequences, mentioned above, to nurture their engagement on a predefined track. Engagement isn’t limited to emails: Ontraport allows 2-way SMS integration (including automated messages like promotions, appointment reminders and confirmations) and automated direct mail campaigns that merge contacts’ names and certain details with letter-writing services to produce individualized, handwritten postcards for a personal touch. Users can segment their contacts based on specified criteria, like demographics or lead score, and track recipient responses. Ontraport also lets users create custom landing pages tailored to the content offered to recipients of email campaigns, or use templates offered through its Ontrapages web builder. In addition, the platform provides direct integration with WordPress accounts to manage content for inbound marketing campaigns. Ontraport provides tools to create members-only WordPress sites where subscribers can access gated content, an affiliate center to view commissions they’ve earned through referrals, or a customer center to view their purchase history and account settings. 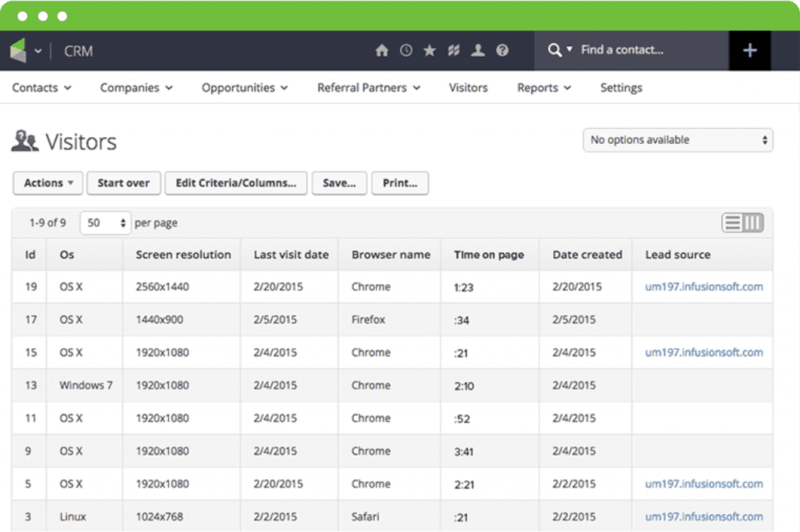 Infusionsoft offers its users a very attractive visual campaign builder. Competing marketing solutions often deploy a sequential list-style view of actions and triggers, but the bird’s eye view for campaign management makes structuring and modifying campaigns far more intuitive than standard in Infusionsoft. While every marketing automation solution entails a fairly steep learning curve, it’s easy to understand your campaigns in Infusionsoft once you know the basics. Infusionsoft also provides automation through its email marketing functionality. 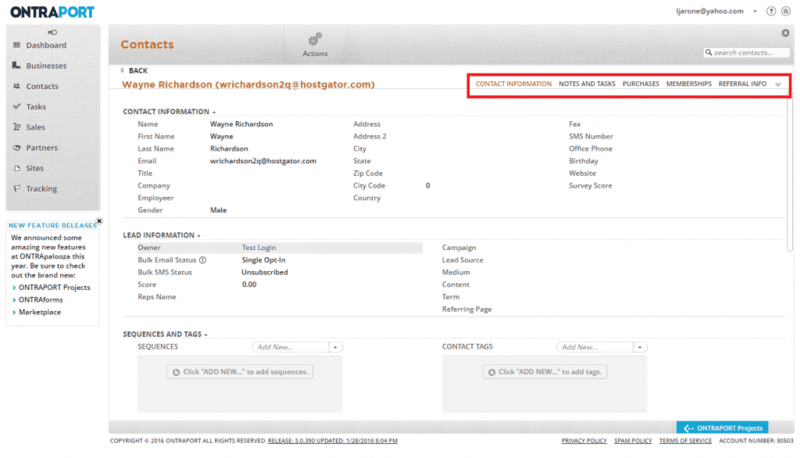 Users can customize campaigns with user-defined triggers or timed delays. Specific actions — such as website visitors signing up for a newsletter, downloading gated content, and obtaining a particular lead score — could entail a specific type of letter personalized with their information. Infusionsoft also allows its users to build custom landing pages. For example, recipients of targeted emails can be brought to pages tailored to the nature of the email, such as a specific product, promotion or location. Landing pages with dynamic content can be further personalized to specific customer interests. 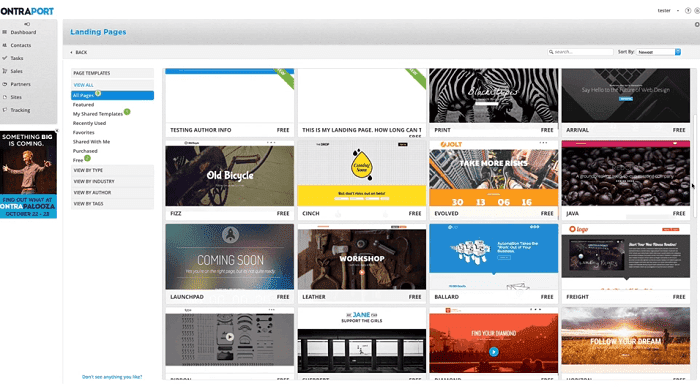 The landing page builder lets users drag and drop design elements like titles, spacers, social buttons, logos and dividers. A/B testing enables users to continually optimize landing page design for higher conversion rates and acquisitions. Infusionsoft also provides email and website tracking. This allows users to gain a sense of which of their marketing assets are performing well, while also obtaining qualifying data on their website visitors or email recipients. Tracking their behavior contributes to effective A/B testing and segmentation, and produces metrics such as lead source, time spent on page, bounce rate, links clicked, browser type, operating system, device type, screen resolution and so on. Effective email optimization can produce higher open rates and clickthrough rates while lowering bounce rates, among other metrics. In all, Infusionsoft offers considerable customization tools for online marketing. It also provides guidance on how to craft marketing assets toward your goals. Ontraport provides very effective marketing functionality ranging from triggered and timed sequences to campaign management tools. Its built-in direct mail automation is a very nice perk — while this can be replicated in Infusionsoft, it’s certainly not built-in; users would need to subscribe to a third-party service for an additional monthly fee to achieve the same results. In addition, Ontraport’s direct integration with WordPress makes it a major plus for businesses that rely on their content generation/content management to attract and sustain their customer base (or who simply operate an ecommerce business through a WordPress site). 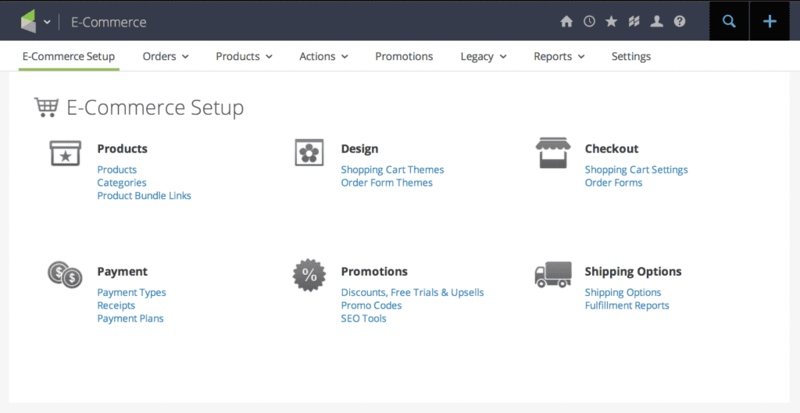 Infusionsoft integrates with WordPress through plugins but not to the extent of Ontraport. On the other hand, Infusionsoft has its own marketing capabilities that Ontraport lacks. I’ve written before that I’m a big fan of their visual, drag-and-drop campaign builder. 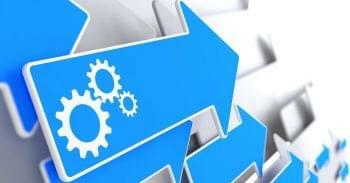 Though it’s a feature common in dedicated marketing automation providers, it is seemingly overlooked in combined sales and marketing solutions — and campaign templates can be found in their Marketplace. While Ontraport will help you build your essential automations through a complimentary two-hour phone setup, the ability to download or purchase pre-built campaigns is an asset to an ambitious business owner. In other respects, Ontraport and Infusionsoft both have comparable capabilities: they both allow targeted mass email campaigns, custom landing pages, A/B tests and optimization, tracking and analytics. As is often the case with business applications, the best platform depends on your use case — if you’re on a tight budget, but want to add personal flair through direct mail, or you work heavily out of WordPress, Ontraport could be for you. On the other hand, if you’re willing to pay for proven marketing campaign templates (and you’re willing to pay more in general) then Infusionsoft has the resources to take you farther, faster. Ontraport and Infusionsoft both provide sales automation tools, opportunity management, pipeline management, online payment processing and so forth. In contrast to many CRMs that are sales-exclusive, both Ontraport and Infusionsoft sales and marketing functionality operate off a single database. While neither platform provides a visual drag-and-drop sales pipeline that sales CRMs love to boast about, Ontraport and Infusionsoft have both helped thousands of small businesses improve sales growth. Thus, they clearly know a thing or two about moving deals through the sales funnel. Let’s see what else they’ve got. Ontraport scores leads and routes them to sales reps according to user-defined criteria and score thresholds. The marketing Sequences mentioned earlier is intended to nurture and qualify leads while sales reps can be notified of customer engagement activities through CRM notifications and automated task prompts. These prompts and reminders spur sales reps to contact leads; based on the engagement outcome, follow-up actions are automatically triggered so engaged leads receive personalized follow-up. Individual tasks touching the same client can be assigned to different team members. 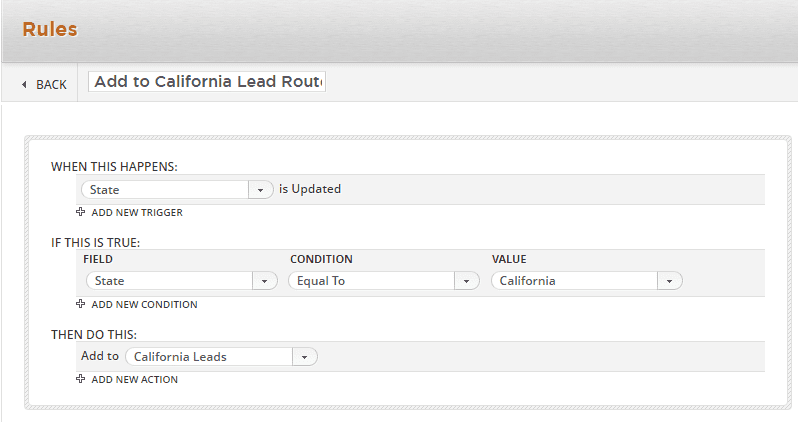 Leads are assigned to sales reps via round-robin or weighted random distribution or by user-defined rules. Ontraport allows for automated task management with daily, weekly and monthly tasks, and CRM workflows (known as ‘business automation’ in Ontraport) to reduce data entry. 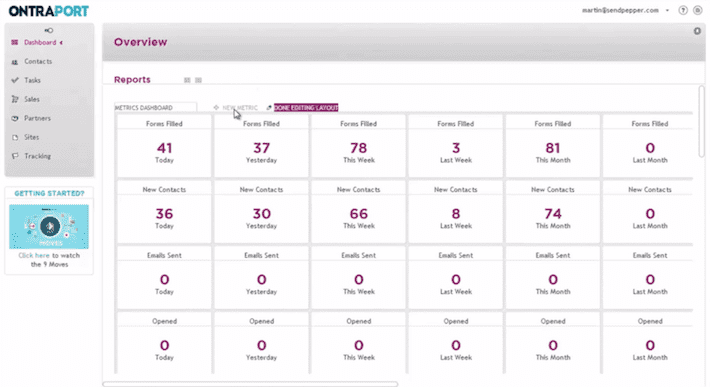 All sales and business automation activity is tracked and can be viewed by admins in activity reports. Ontraport also provides ecommerce tools to users, including shopping cart management, custom order forms, upsell forms, CRM sync and secure online payment processing in the Pro plan. Users can use Ontrapages to design landing pages for ecommerce websites or WordPress sites, and create members-only sites to provide content, support, or partner management tools (for referral marketing) to registered users. Infusionsoft’s sales automation, opportunity management and ecommerce tools align with its marketing automation features. Infusionsoft presents prospects, leads and opportunities in conventional list format with relevant properties arranged by rows. While less visually appealing than a drag-and-drop sales pipeline (which is offered by some CRMs) this may have been a deliberate design choice to avoid making the visual campaign builder redundant. Infusionsoft offers default sales pipeline stages and users can add, customize or remove them according to their sales processes. Users move prospects through pipeline stages manually; meanwhile, Infusionsoft will update tags or triggers automatically based on movement into or out of a stage. Infusionsoft’s Complete plan provides sales assets such as order page templates (and customization tools), shopping carts, online payment processing (including one-time or recurring payments), order fulfillment, inventory management and the ability to design and send custom quotes and invoices. Users can build customer referral programs with promotional rewards, create flash sales, re-engage lost leads, etc using campaign templates available for download from Infusionsoft’s Marketplace. As mentioned earlier, user updates to opportunity records can trigger automations in the online storefront. Infusionsoft notifies sales reps when customers accept a quote, convert quotes into orders, and update the customer’s purchase history within the CRM, contributing to additional personalization of post-purchase marketing outreach. Infusionsoft can calculate lead scores on a variety of criteria, including custom tags and website activity, and present the current most qualified leads prominently on sales reps’ dashboards. Infusionsoft provides ecommerce tools for small businesses to build an online storefront with inventory management, order fulfillment and payment processing. Infusionsoft sales automations help streamline task and appointment management, notifications, pipeline stage-related processes and lead scoring. The balance between Ontraport and Infusionsoft seems to be the former offers an impressive range of functionality at a very fair rate; the latter offers greater functionality, probably more potential and ease of use, but you’ll be paying more in subscription rate, add-ons and purchased assets. (Note Ontraport also offers creative assets for subscription or sale in their in-app Marketplace.) This theme holds true regarding sales automation and associated features. Ontraport provides considerable sales automation when it comes to contact, task and opportunity management with Sequences, business automation and CRM sync with online storefronts. Its lead scoring and routing is fairly easy to set up. Infusionsoft provides these features with slightly more robust tools for online inventory management, order fulfillment and processing. The two platforms’ capabilities are very comparable, but I give the edge to Infusionsoft. Ontraport and Infusionsoft collect data on nearly all interactions performed within the platform, including marketing, sales and CRM activity. Both platforms provide the ability to track website visitor and email recipient behavior, performance of marketing assets, sales by rep, pipeline stage activity and so forth. 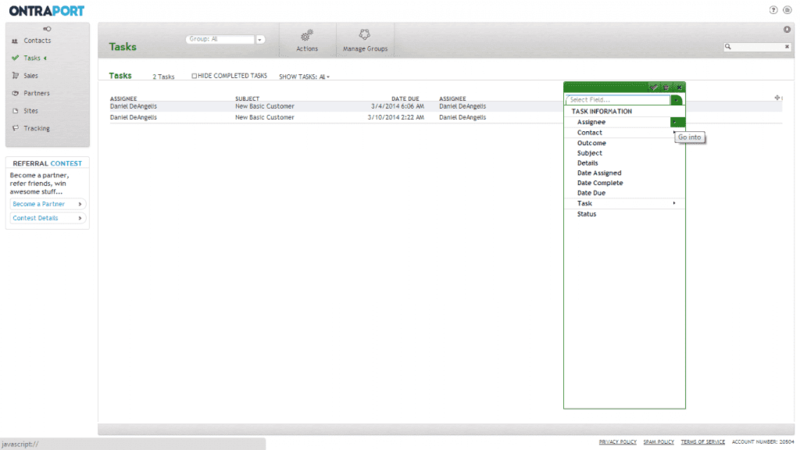 CRM admins can produce reports on user logins and other use. Finally, users can create custom dashboards to obtain real-time insights on their business data. Ontraport provides users a customizable, drag-and-drop reporting dashboard that gives real-time insight into sales performance by groups and reps over time periods. Users can create new metrics with custom timeframes and arrange them on the dashboard to present essential KPIs at the top of the page. Comparing consistent metrics between specific events or between campaigns allows for better campaign optimization. The data is derived from marketing activity like open rates and clickthrough rates, conversions or downloads, sales activity such as revenue over time or costs per customer, CRM activity like user logins, created and fulfilled tasks, and so on. This permits not only an in-depth view of recent performance but also allows forecasts going forward. Ontraport also partners with third-party reporting apps for additional reporting and analytics functionality. Infusionsoft provides its users with analytics and reports on marketing campaign performance and sales histories, order and billing, CRM activity in addition to custom reports. The platform brings this data together in dashboards, which displays a real-time summary of key metrics or data points like lead source ROI, customer lifetime value, monthly sales and so forth. Marketing reports will provide KPIs on various marketing assets, such as open, clickthrough, and conversion rates; reports on customer data, such as leads by source or segment; and reports relative to sales metrics like conversions by sales stage. These reports are essential for A/B tests, optimization and maximum ROI. 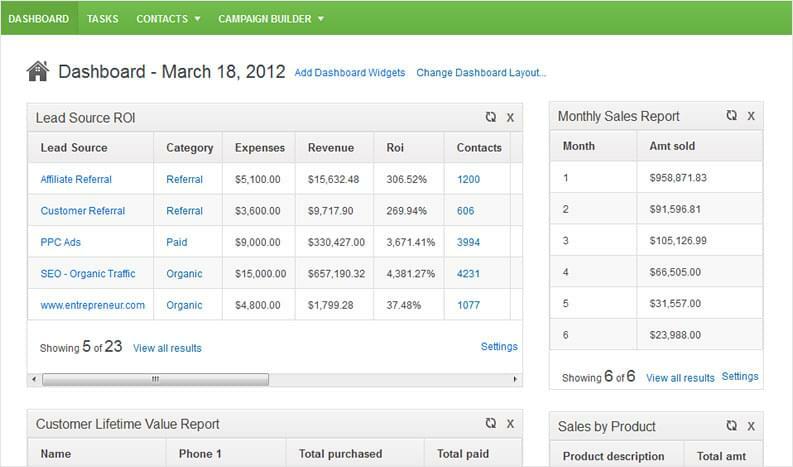 Infusionsoft also produces sales reports, like revenue by lead source, product and segment. It provides an overview of sales activity, such as generated sales by rep, average time spent in pipeline stage, projected revenue, revenue by referral and more. It also allows users to create custom opportunity reports. As far as ecommerce reports, Infusionsoft provides over 20 built-in billing and accounts reports with sales, payments, subscription revenue, receivables and credits summaries. Other reports include customer lifetime value reports, income reports by lead source and performance of custom order forms. Regarding admin use, reports can also be produced on user activity like logins, added records, all tasks according to filterable properties and all associated notes. 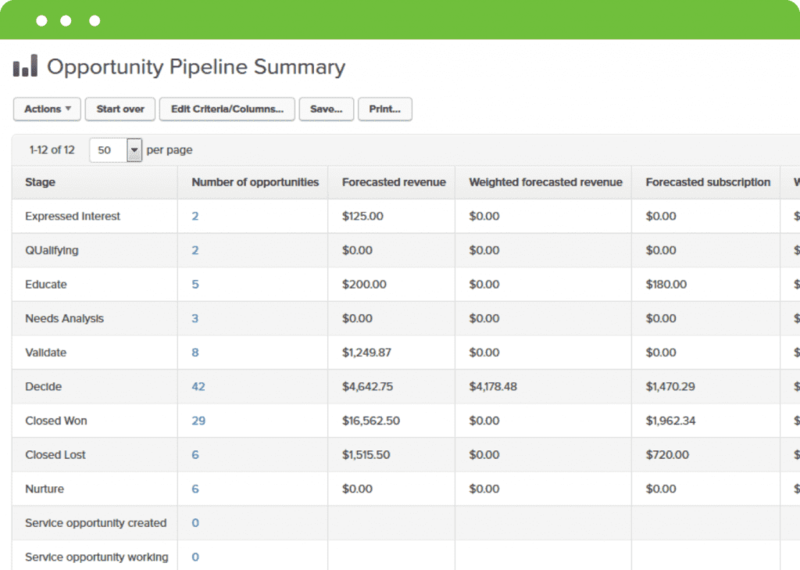 There’s quite a bit of built-in reporting and analytics capability in Infusionsoft’s Complete plan, not to mention extensions available for download or subscription via the marketplace. Ontraport and Infusionsoft both come with pretty robust built-in reporting functions. Ontraport’s dashboard offers users a lot of customization features to put key user-defined metrics in front of sales reps. The accessibility of data derived from integrated marketing, sales and CRM activity gives businesses considerable advantage in analyzing past campaigns and activities, forecasting results and optimizing strategy. The Ontraport dashboard isn’t visually engaging (it’s essentially a large spreadsheet), which matters less than whether it serves its role (which it does) but still somewhat detracts from the user experience. Infusionsoft doesn’t allow this level of customization out of the box, but its built-in reporting templates are quite effective and visually engaging, at least compared to the Ontraport version. In addition, Infusionsoft offers 22 reporting and analytics integrations in its Marketplace (many of which through paid subscription). Provided you’ve got the budget, Infusionsoft’s built-in reporting templates, visualization tools and integrations provide more comprehensive reporting than Ontraport; however, for use cases with limited budgets, a smaller team or simply a strong desire to present customized metrics in rather utilitarian fashion, Ontraport is a strong contender. Ontraport and Infusionsoft both offer paid and free integrations that can extend the functionality of their platforms. Infusionsoft’s Marketplace offers integrations with business applications or additional communication channels; Ontraport’s in-app marketplace is a venue to obtain free and paid creative assets. Ontraport has also partnered with third-party companies to sync Ontraport accounts with common and popular business software. Ontraport provides two types of integrations — one for creative assets, which are available for download (both free and paid) through the in-app Marketplace. This includes email templates, landing page templates, individual design elements and so forth. Ontraport also enables extensions to its software functionality through partnered integrations with third-party apps. These include apps to functionality for ecommerce, members-only sites, landing pages and webinars, social integration, accounting and scheduling, web pop ups, helpdesks, video hosting and more. Read the table below for Ontraport partner integrations by type. Ontraport’s Marketplace offers a diverse range of landing page templates while their partnerships with popular third-party apps provide useful extensions for ecommerce, lead generation, lead nurturing, multichannel communication and more. 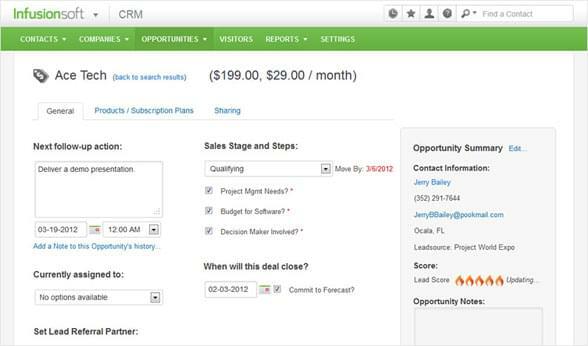 As of this article, Infusionsoft makes available 596 paid and free integrations in their online marketplace. (273 are free and 323 are paid.) These integrations are offered as first-party add-ons or through third-party, Infusionsoft-certified developers. The integrations are listed in four categories — Action Plans, Apps, Campaigns and Services — and identified between fourteen application types, from ‘Integrations’ that add features to the platform, such as SMS automation or a modified user interface, to ‘Lead Gen’ which might enable pop-ups on your website, to ‘Social’, which might add the functionality to add contacts via Twitter lead campaigns. Review this table for a few high-rated applications among Infusionsoft’s integration types. Ontraport offers a considerable variety of landing pages for download through its in-app Marketplace, and — as of writing — 69 partner integrations within the categories listed above. It’s a pretty impressive number; integrations exist to complement built-in features with functions or data from external sources, and as Ontraport provides pretty wide-ranging functionality, the argument can be made that it doesn’t require the amount or type of integrations of other CRMs. In my opinion that view would be correct. 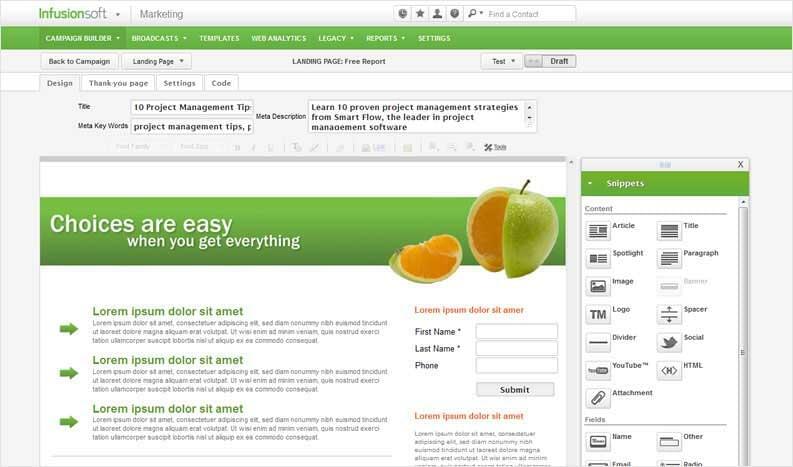 Infusionsoft offers comparable built-in functionality but offers a much wider array of functional integrations. As of this writing, Infusionsoft offers 593 paid and free integrations in their Marketplace; while this number includes creative assets, which Ontraport separates into their in-app store, there are still considerably more integrations with better-known apps. Of course, the name-recognition of these apps is moot unless you use them, but Infusionsoft increases the likelihood that they’ll integrate with your existing or preferred third-party solutions. For these reasons, Infusionsoft gets the win for integrations. Ontraport and Infusionsoft offer knowledge base libraries with beginner guides, how-to articles, FAQs and videos. They also offer community forums and online chat. They differ slightly in their respective support offerings; see below for details. Visiting Infusionsoft’s help center presents two options — phone support and live chat. While a few CRMs decline to offer phone support due to cost, Infusionsoft is not one of them; they offer an 11 hour window of service on their local time. Not too shabby. They also provide 24/7 live web chat, which is helpful. However, they don’t offer email support or online ticketing. As mentioned earlier, they provide an in-depth knowledge base with instruction manuals, user guides, videos and webinars. They also offer a 3-day onsite training course called Infusionsoft University with direct instruction on learning fundamentals and advanced tools. Ontraport also provides phone support and live chat. Their specific phone hours aren’t available on their site. Ontraport provides email support, and like Infusionsoft, they have an extensive knowledge base with instruction manuals, user guides, videos and webinars. Unlike Infusionsoft, Ontraport also has a degree of social media support; their Facebook community group lets users post support questions, which can be turned into tickets; the in-app training program called Ontraport Projects offers step-by-step instructions for using features and each page has a section dedicated towards explaining the role of a specific feature in broader processes. In addition, Ontraport offers a 3-day, 20-hours onsite training course to teach neophytes and experienced CRM users alike the ins and outs of the platform. Ontraport’s customer support has an incredibly high satisfaction rating. While Infusionsoft is certainly no slouch, and is known for walking their customers through setup and support issues, Ontraport goes a step beyond and thus takes the win. To create a relatively balanced head-to-head comparison of Ontraport vs. Infusionsoft, I chose two plans that represented each platform’s respective capabilities and also a price point within the budget of the majority of their target customers. For Ontraport, this was their mid-tier Pro plan; for Infusionsoft, it was their Complete plan. Each vendor has other plans available. See below for details. Ontraport offers three subscription plans with no required onboarding. The first three months are billed at the monthly rate; after three months, customers can opt for an annual contract for an 18% discount. Ontraport also offers a 90-day money back guarantee, which is unusual for CRMs. *The 2-hour complimentary setup in the Pro and Team plans entails an Ontraport team member setting up essential automations on your behalf. Infusionsoft offers five subscription plans and three types of Kickstart onboarding packages, which are a required one-time purchase. Note that all Infusionsoft subscriptions are annual contracts that are billed monthly. Infusionsoft customers can choose any Kickstart package they prefer, regardless of their subscription plan. Verdict: Ontraport requires its customers’ first three months to be billed monthly. After this, customers can choose to continue with monthly or annual contracts, both of which are billed monthly. An annual contract will give customers an 18% discount. Ontraport also offers customers a 90-day money back guarantee. I haven’t encountered that in this space before. It’s very much worth noting that Infusionsoft requires its customers to make the one-time purchase of a Kickstart package which begins at $999. You don’t need me to tell you it significantly increases the upfront cost, especially for budget-sensitive small businesses. While the Kickstart package is valuable, and intends to prepare customers to hit the ground running with their new software, the fact that it’s required and only annual contracts are allowed stands in pretty stark contrast to Ontraport’s option of monthly billing and 90-day money back guarantee. For customers who need slight increases to their plan allotments without upgrading to a higher level plan, Ontraport also makes it simpler than Infusionsoft. While the latter would have you contact a sales rep for a custom quote, Ontraport lists the price for expanded email limits, contacts and additional users. For the two plans listed — Infusionsoft’s Complete plan and Ontraport’s Pro plan — Infusionsoft would cost you nearly a third more than Ontraport, assuming you used each platform out of teh box and chose the cheapest of Infusionsoft’s Kickstart packages. And that’s also assuming you chose a monthly Ontraport contract for all 12 months. If you switched to an annual contract and received the 18% discount, Infusionsoft would cost you nearly twice as much. Their built-in features are comparable, and Ontraport even offers a few things Infusionsoft doesn’t. Ontraport takes the win for pricing. Ontraport and Infusionsoft are quite comparable platforms; they both offer combined sales and marketing features, ecommerce integration, built-in reporting tools and a plethora of integrations. While they differ in specifics when it comes to marketing features, they largely overlap; Ontraport offers built-in direct mail automation, Infusionsoft has a very intuitive visual campaign builder, but both have a familiar system of rule-based automation that CRMs have employed for quite some time. Ontraport provides direct integration with WordPress, which is great for prolific content generators, and built-in tools to create members-only sites and accept online payments. Infusionsoft provides useful, customizable dashboards for a number of functions, including for reports, which I think compares favorably to Ontraport’s (see the Reporting & Analytics section). When it comes to price, Ontraport has Infusionsoft beat handily, especially regarding upfront investment (the first month of Ontraport will cost only a month’s subscription, which customers can get back through the money back guarantee, while Infusionsoft customers must sign an annual contract and purchase a Kickstart package). Ontraport also ranks higher than Infusionsoft regarding customer support, in terms of available channels and overall satisfaction, although Infusionsoft is no slouch. As always it comes down to your use case. If you are an entrepreneur, and you want a highly effective platform with a plan suited for one or two users, Ontraport provides considerable value out of the box, for a very fair price and a great reputation for support. It’s a great option for young businesses on a budget or — considering the generous capacity for monthly emails and records — for businesses heavily reliant on WordPress and email marketing for content generation, lead generation and online sales. Ontraport has a great array of resources for that. On the other hand, for businesses with more upfront capital to spend and the ambition to invest it in the right platform, Infusionsoft provides not only the sales/marketing tools but also guidance on using them. The Kickstart package, while posing considerable upfront cost, ensures customers are invested in their own success to train in the software. Infusionsoft knits its features together in a more visually engaging, comprehensive platform, and its integrations — while also posing additional hidden cost — offer customers the potential to extend the platform beyond what Ontraport can do. To reiterate, Ontraport is a very effective platform for very small businesses looking for a very capable out of the box app to add a personal offline marketing touch or a go-to console to manage a WordPress-based blog and ecommerce store. In fact, for those use cases and probably several more, it’s a better option than Infusionsoft. But for most other use cases spanning several business types, Infusionsoft can do more for you, take you farther and assist you along the way — provided you’ve got the budget. 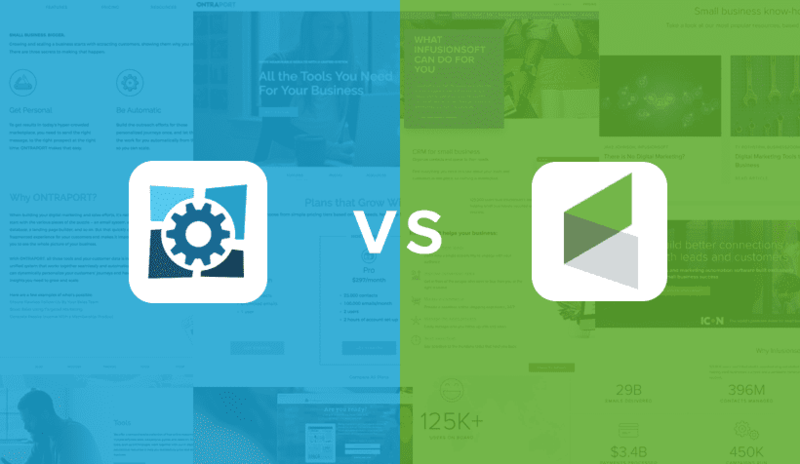 For another head to head, check out our article on Infusionsoft vs. HubSpot. For all-inclusive CRMs or marketing platforms, check out our CRM comparison guide or our marketing automation comparison guide.